The room was very spacious and clean. Bed(mattress) could be better, but overall, it’s very good for the price. Next to it is The Thumb plaza which has many restaurants, bars and a supermarket. No.9 train station is 10 minutes walk. The front desk Mr. Ye is very helpful. Will stay in there again. Well located near the SNIEC Convention Centre. Around the Hotel are many Dining and Shopping possibilities. The lobby is quite nice, have a nice bar downstairs. King & Johnny at the Reception proved to be absolutely incredible hosts. They were most polite, incredibly efficient and quick to check us in, and meet our requests. Absolutely recommend this hotel to anybody attending Exhibitions at SNIEC. The staff was polite and eager to please. When there was an issue with my room, they quickly removed me to another one. Surrounding Thumb plaza is convenient and offers lots of options for restaurants, bars and coffee shops. One of our top picks in Shanghai.Featuring free Wi-Fi in all areas, Grand Mercure Shanghai Century Park (Formerly Radisson Blu Hotel Pudong Century Park) is located in Pudong District, a 3-minute drive from New International Exhibition Center. It offers a swimming pool, a fitness center and rooms with free internet. Grand Mercure Shanghai Century Park is 11 minutes' drive from Century Park and 16 minutes' drive to Lujiazui Financial Area. 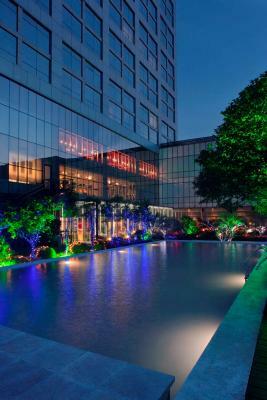 The hotel is a 35-minute car journey to Pudong International Airport. Shanghai Disneyland can be reached within 27 minutes by car. Jing'an Temple is around 25 minutes' car ride away. 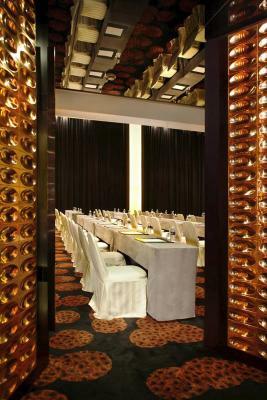 The modern rooms at Grand Mercure Shanghai Century Park are fitted with large windows and have plenty of natural light. Amenities include a flat-screen cable TV and safety deposit box. The see-through bathrooms come with a bathtub and hot shower facilities. Guests can indulge in a relaxing massage at the spa. Hotel provides car rental services and free parking. Travel and sightseeing activities can be arranged at the tour desk. 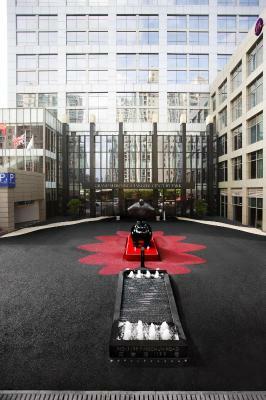 When would you like to stay at Grand Mercure Shanghai Century Park (Formerly Radisson Blu Hotel Pudong Century Park)? Located from levels 18 to 20, the stylish room features a King Size bed and free broadband and High-speed WiFi access. The room features a King Size bed, large working desk, oversize bathroom with separate shower and bathtub, and free High-speed WiFi. The room features a King Size bed, comfortable sofa, desk area, modern bathroom with separate shower and bathtub, tea and coffee making facilities, large TV with international channels and free High-speed WiFi. This suite offers expansive views of Shanghai and has a separate living area. It features a large work desk, oversize bathroom with separate shower and bathtub. You will enjoy Club Lounge benefits. This suite features a spacious work area and free High-speed WiFi. You will enjoy Club Lounge access for the buffet breakfast and happy hour. The room features a comfortable sofa, desk area, modern bathroom with separate shower and bathtub, tea and coffee making facilities, large TV with international channels and free High-speed WiFi. Located from levels 18 to 20, the stylish room features two single beds, free broadband and High-speed WiFi access. You will enjoy Club Lounge access for the buffet breakfast and happy hour. The room is equipped with 2 Single beds, a flat screen TV, free broadband and WIFI access. The room features 2 Single beds, a large working desk, oversize bathroom with separate shower and bathtub and free High-speed WIFI. House Rules Grand Mercure Shanghai Century Park (Formerly Radisson Blu Hotel Pudong Century Park) takes special requests – add in the next step! Greatwall Grand Mercure Shanghai Century Park (Formerly Radisson Blu Hotel Pudong Century Park) accepts these cards and reserves the right to temporarily hold an amount prior to arrival. Grand Mercure Shanghai Century Park (Formerly Radisson Blu Hotel Pudong Century Park) accepts these cards and reserves the right to temporarily hold an amount prior to arrival. Please kindly note that the outdoor swimming pool will be closed from September 2018 to June 2019. Great room on the top floor, good breakfast, friendly stuff, very close to Expo (literally 3-5 min by taxi). * Shower leaked all over floor. * No hot water for bath, but hot water for shower? * Bed very uncomfortable. Very soft in the middle. It was like sleeping in a hammock. * For the price, expected better. * Good location. * Professional reception staff. Hallway had some kind of rain or water leak - it looked and smelled very bad when you were walking in the hallway. But the room itself was superb. 1.window not closing properly, the wind blowed the window open and made strange sounds. 2.the shower is not working properly 3.the bed is oblique, very uncomfortable to sleep. 4.crack on the walls; 5.the light above the toilet is twinkling. 6.can not borrow the umbrella without deposit again. 1.window not closing properly 2.the shower is not working properly 3.the bed is oblique, very uncomfortable to sleep. 4.crack on the walls; 5.the light above the toilet is twinkling. 6.can not borrow the umbrella without deposit again. Checked their breakfasts, didn’t think it worth to RMB168, so didn’t take it. You can still see someone on the toilet even if you try to cover the windows... It makes no sense.